Tough, resilient, fracture resistant, absorbs shock. Insoluble – Will not wash out or crumble. 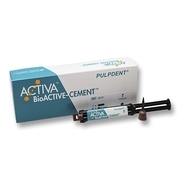 Releases and recharges calcium, phosphate and fluoride. Chemically bonds – Seals against bacterial microleakage. No sensitivity. Moisture tolerant – Simplified technique – No etching, no bonding. Light cure and self-cure. Available in A2 and translucent shades. 5mL/7gm syringe, Translucent Shade, + 20 automix tips (15 straight black + 5 with bendable metal cannula).